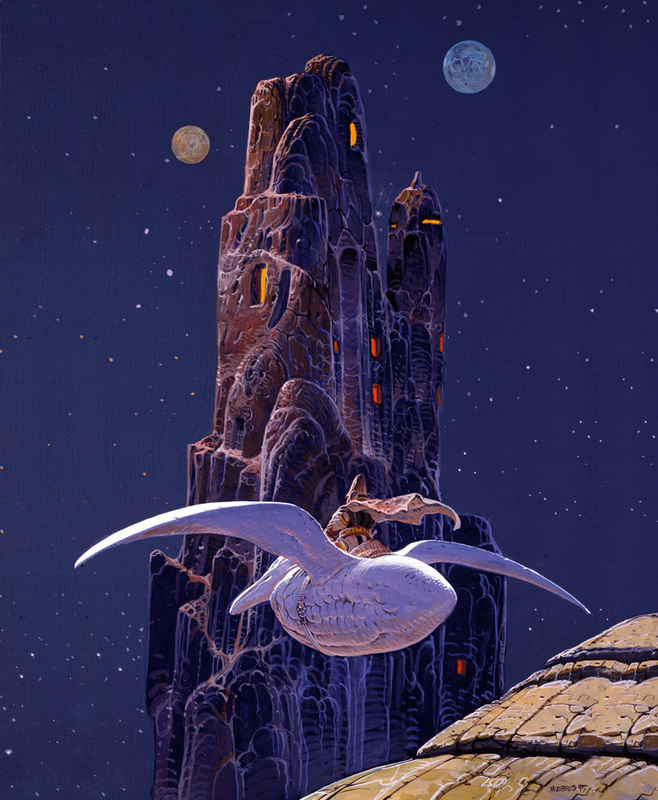 I'm incredibly sorry to hear that the artist Jean Giraud, known to many of us as Moebius, has passed away. Giraud was a genre unto himself: his work was unique, inventive, mind-expanding and utterly magical. He broke down barriers through the sheer force and fearlessness of his imagination and inspired generations of creators. Looking at a Moebius graphic novel you weren't just reading a book: you were Alice falling down the rabbit hole; tumbling, head over heels, into a strange, and somehow truer, reality. What a loss. "Weird and fascinating" is right, David. The Moebius version of the Sufer really cracked Norrin Radd, and his world, wide open. Very different from other versions, yet utterly true to the character. I urge you to seek out Moebius's other work, especially his science-fiction and fantasy stories. (Back in the 80's Marvel's Epic Comics reprinted a number of Moebius graphic novels and that's what first introduced me to his work.) It's a trip well worth taking. I'll have to check his other work out. Maybe I'll see if PARABLE is in TPB or hardcover, too. I live in France and here Moebius is really big, as he's been both a very important figure for SciFi (with the Edena and Incal cycles) as well as for classical comics (his tenure on the Blueberry series has an impressive total of wonderfully drawn and narrated tomes). Thank you J.M. to have taken the time to mention him. I was lucky enough to meet him twice and remember him fondly. A great man, very generous with his time and his passion, too. I never got a chance to meet him, Stephane, but I feel as if I've met him in the Realm of Imagination. And that, to me, is Moebius's greatest legacy: his uncanny ability to translate that Realm into a visual reality we could all joyfully lose ourselves in. Thanks for checking in at Creation Point. Come back again! Yes, Moebius does this to people :) I still have an unpublished interview that I did with him at the beginning of the nineties, I'll try to type it and publish it soon. I will definitely come back as I'm a big fan of yours from the days of Brooklyn Dreams, Moonshadow and Shambala. Only this morning did I decide to find you online. I've loved your work for many years for what you did with your tales of awakening (I'm not into monthly super heroes so much, so I only read your 'more personal' works – I don't know if what I mean is conveyed well by my english, but hopefully it is), all flattery aside. Your English is clear as a bell, Stephane...and DEEP thanks for the kind words about my work. BROOKLYN DREAMS is near and dear to my heart and I'm constantly amazed, and grateful, when I discover readers who feel the same way. As deeply personal as it is, I hoped BD would strike a universal chord and -- for some people, at least -- it has. VERY happy that we got the new IDW hardcover out a few months back. It's a beautiful edition. "The only way this book could get any better is by having Kaine backup stories written by JM DeMatteis." "Some Ben Reilly flashbacks like those he wrote for Web of Spider-Man vol 2 would be good too." "I'd be down for some Ben AND Kaine flashbacks courtesy of JMD. Any excuse to get more stories from him is fine by me." Naturally, I agreed with the sentiment! I probably sound like I'm beating a dead horse here, but I've let Marvel know (repeatedly) that I'd LOVE to see you involved with Ben Reilly and Kaine again. Apparently I'm not alone. Preferably with a Ben Reilly title alongside SCARLET SPIDER, but I don't think the market encourages too many 'line' titles these days. Unless your franchise has an 'X' or a 'Bat' in it, that is! Well, we could call the book BAT REILLY, X-TREME HERO! Joking aside, David, deep thanks for your support. I'd love to write more Ben and Kaine but that decision isn't in my hands. LOL! And we'll sign Todd McFarlane up as the artist. It will sell out before the first issue's been printed! I know it's not your call, but I love to talk about the possibility, and I always encourage fans to write Marvel and let them know what they want! If enough people take the time to fire off a friendly email, amazing things can happen. Yeah, that's the part that amazes and delights me, David. For all its warts, and there were many, the Clone Saga had some great characters and some great stories. Glad to see them taking their place in the Marvel Universe. I love Moebius' work on Silver Surfer. I really want to read stuff like Blueberry and The Incals but theyre not in English. Do translations exist? If so where can i find them?